Banana Peels Can Help Treat Acne and More! 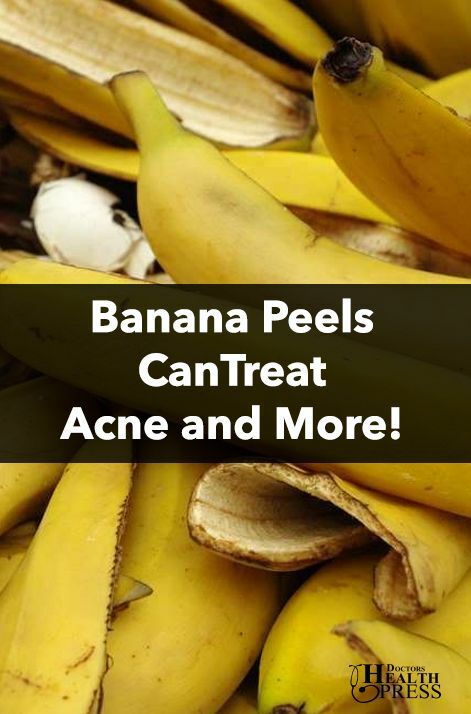 Home » Skin Care » Banana Peels Can Treat Acne and More! There are many different types of acne treatments, from medication to skin creams to natural oils, but what about using a banana peel for acne? While it might sound a little out there, using a banana peel for skin blemishes and pimples is one of the easiest, most effective treatments available. Bananas have many health benefits when eaten, but banana peels are also loaded with nutrients and antioxidants that can reduce skin inflammation. Many people suffer for years with acne, bouncing from one treatment to the next, spending countless dollars. Often, natural remedies can be just as effective as store-bought treatments, and they’re usually more affordable and have less side effects too. If you have acne, a banana peel should be the first treatment you try before emptying your wallet. Step 1: First, rinse your face with cool water to remove dirt, oil, and debris. All of these things can contribute to acne and may reduce the effectiveness of the banana peel treatment. You may also want to use a cleanser to help clean your face. After rinsing your face, pat yourself dry with a towel. Step 2: Select a ripe banana. The banana should be yellow or brownish, rather than green. Unripe green bananas actually have fewer nutrients, so they may be less effective for acne treatment. Step 3: Peel the banana. For this acne treatment, you do not actually need the banana, just the peel. This means that you can eat the banana, if you want, and simply save the peel. It can be a good idea to cut the banana peel into smaller pieces, so it is easier to use on your face. To do this treatment, you need to use the peel relatively soon after you remove it from the banana, so only do this step once you’re ready to begin. Step 4: Take the banana peel and gently rub the inside of the peel (the white part) over your face, particularly areas with acne, blemishes, or pimples. After rubbing for a couple minutes, you will notice that the inside of the peel changes from white to black. This is from the dirt on your face that the peel is soaking up. Once the peel has turned to black, use another piece or part of the peel and continue gently rubbing your skin for 10 minutes. Step 5: Once you have used the banana peel, do not wash or rinse your face. Banana peels are loaded with nutrients, such as vitamins A, B, C, and E, as well as zinc, iron, and potassium. These can help fight acne inflammation and hydrate your skin. As well, the banana peel will also fight off bacterial infections. Washing off the peel after the treatment will remove these effects. Instead, it is best to leave the peel on and go to bed afterwards, which will give your skin time to absorb the full benefits of the peel. Step 6: Repeat the banana peel treatment daily before you go to bed for at least a week. You should begin to see the positive benefits on your skin by the end of the first week. Your acne should start to clear up and your skin should become less inflamed. If using the banana peel seems to irritate your skin, then it may be because you’re rubbing too hard. If gently rubbing still irritates your skin, then it is best to stop. However, the banana peel treatment is usually one of the best treatments for sensitive skin. 1. Banana peels can be used to combat wrinkles and ageing skin. They help tighten and hydrate your skin, as well as remove contaminants which contribute to skin ageing. 2. Banana peels are also effective for other skin conditions, like psoriasis and eczema. The banana peel treatment can reduce the severity of these skin conditions in as little as a couple of weeks. 3. Banana peels can also help fight off warts. Simply taping a banana peel piece over your wart and leaving it on overnight can help reduce warts. 4. Banana peels are great for absorbing dirt, and they are also great for absorbing allergens, contaminants, and toxins. If you have an itchy bug bite or have a rash from poison ivy, gently rubbing a banana peel over the affected spot can help remove the itchiness and inflammation. 5. There are no serious side effects from the banana peel treatment. If you’re not seeing the desired effects after one week, you can do the treatment up to three times every day for improved results. 6. Using banana peels for acne scars and pockmarks are also effective, as they hydrate the skin. Not only are banana peels good for your skin, but they’re good for many other things too. If you thought using banana peels on your acne was a little strange, then you will probably be shocked to know that some people actually eat banana peels. Because of their nutritious content, banana peels are a very healthy option to add to your meals and diet. Banana peels are loaded with nutrients, fiber, and minerals. They contain high amounts of potassium, magnesium, vitamin C, and some B complex vitamins, which are all essential for good health, energy, cell development, and stronger immune systems. Banana peels also contain fiber and protein. Fiber is particularly important for good digestion, and many people eat diets that are deficient in fiber. Having one banana peel per day could give you a good chunk of your daily fiber needs. Banana peels are tough and do have a bitter taste, which can turn some people off from eating them. However, there are plenty of ways to prepare banana peels to make them into tastier treats. You can throw a banana peel into a blender with other fruits to make a delicious smoothie. You can also boil the peel for 10 minutes, which will give it a nice, easy-to-eat tenderness. Banana peels are good for your skin, good for your body, and good for the health of many other living things too. If you grow plants, vegetables, or flowers, banana peels can add a lot of nutrients to your soil. Using them in compost or soaking them in water and using the juice to water the soil will help grow your plants. As well, they can make great treats for certain pets, such as rabbits. Cutting up a banana peel and mixing it in with their feed is a healthy boost for many animals. Of course, research beforehand to make sure that banana peels are safe for your pet, as they might not be healthy for some animals. Banana peels are one of the most nutritious substances we commonly have in our homes, and yet most people throw them out. For smoother skin, more energy, a stronger immune system, and all-around better health, you should make banana peels a staple of your skincare routine and diet. Don’t Throw Away the Banana Peel! Banana peels are an incredibly effective treatment for acne, skin blemishes, and other skin conditions. When you use banana peels for your skin, before and after comparisons may shock you. Who would guess that something we usually throw in the garbage can have such a big effect? So next time you’re eating a banana and about to throw away the peel, save it for later—your skin will thank you! “How to Treat Acne With Banana Peels,” wikiHow web site; http://www.wikihow.com/Treat-Acne-With-Banana-Peels, last accessed December 10, 2015. Mukherjee, A., “Use Banana Peel To Treat Acne on Face,” Fit and Happy web site, January 2, 2015; http://www.fitandhappy.org/acne/1457-use-banana-peel-treat-acne-face.html. Olson, S., “Health Benefits Of Bananas And Their Peels: 10 Unusual Ways To Use The Entire Fruit,” Medical Daily web site, August 04, 2014; http://www.medicaldaily.com/health-benefits-bananas-and-their-peels-10-unusual-ways-use-entire-fruit-296454. Orwig, J., “People around the world are eating banana peels because they know something that Westerners do not,” Business Insider web site, September 26, 2015; http://www.businessinsider.com/benefits-of-eating-banana-peels-2015-9. Radhakshrishnan M., “5 Simple Steps To Use Banana Peel To Treat Acne,” Style Craze web site, October 12, 2015; http://www.stylecraze.com/articles/simple-steps-to-use-banana-peel-to-treat-acne/.